The Mekong is the most important river for most of SE Asia as it crosses or borders, Myanmar (Burma), Laos, Thailand, Cambodia, and VietNam. We will be using several sources and will give the links to them so you can do more research if interested. 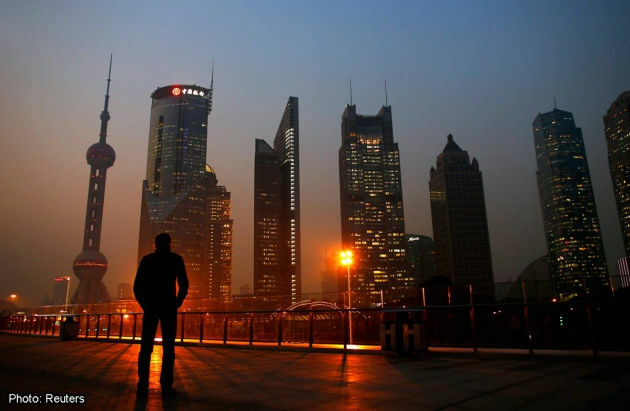 For years, China was a promised land for expanding multinationals and manufacturers, drawing hordes of expatriate employees eager to capitalize on the country’s billion-plus consumers. Could those days be over? A new study by UniGroup Relocation, which moves over 260,000 families per year worldwide for work, suggests they might be. According to the company’s customer data, twice as many people moved out of China than into the country in 2014. We set off for the long awaited mountain oasis of Dali, departing Kunming on the overnight sleeper. One reasonably comfortable sleep and we woke, excited and ready for our cultural excursion into South-Western China. Disappointment! We arrived to find a modern looking city, with tall buildings and highways, rather than the iconic town we expected. Fortunately, a forty-five minute drive brought us to Old Dali Town. Our excitement grew as we took in the Bai style architecture, the beautiful archways and the cobblestone streets. The taxi dropped us in a lane of concrete structures, but we soon found our accommodation snuggled between these buildings. Sleepy Fish, seemed an apt description; peaceful and tranquil, yet sizzling with the energy and excitement of many travellers. Our Bai style room provided a spacious verandah, which over-looked beautiful well-kept gardens. It couldn’t have been more pleasing, being situated in a quiet area near the impressive ‘East Gate’, yet just a walk from the hustle and bustle of the central shopping area. We felt incredibly relaxed and excited, as we began our exploration of this ancient and historic town and it didn’t disappoint. The buildings impressed, with their mix of classic Chinese and Bai-style architecture. Beautifully carved wooden concertina panels and doorways, decorated with colourful lanterns, adorned every shopfront and most residences. We strolled down narrow, interesting streets and alleyways that ran off wider paved avenues, discovering grand arches, ponds and sculptures, and calming gardens with flowing water. This apparent mishmash, created a tranquil ambience against the contrast of these colourful and noisy shops. After so much ‘modern development, we bathed in the light of this Chinese Shangri-La. Here we could luxuriate amongst the clamour and crush of local and ethnic shopkeepers, tourists and Chinese holiday makers, or delve into the glorious array of food, flora and fauna, and natural beauty of the surrounding environment. The town’s history is also interesting. Dali rose from a settlement into a significant town in the early period of the Ming Dynasty and is regarded as one of China’s most beautiful environments, being situated on the banks of the Erhai Lake, which literally means: the ear-shaped sea. This high altitude lake sitting 1,972 metres above sea level, at 41.5 km in length, by 6.9 km in width, is the seventh biggest lake in China. The lake, the town and the surrounding valley, are all surrounded and beautified by lush forested mountains with jagged limestone peaks. No matter where you stand in Dali, the mountains dominate the view. The whistle of the wind through their crags and forests, seems to whisper to you; ever beckoning with the offer of mystery and adventure. Under such a spell, we set off for the base of Cang Shan Mountain (pronounced Tounge Sen). We couldn’t find a pathway to walk up, so we decided upon the chairlift instead. We rode up through the misty pine-forest canopy, rising close to the top of the Cangshan Range at 4,122 metres above sea level. At this point, we hadn’t considered the need for a rain coat, or even an umbrella, so, true to form, about half way to the top, the heavens opened up. Considering we still had fifteen minutes to travel to our destination, this became a problem. We arrived at the top, sodden, shivering and looking more than a bit bedraggled. The noise of the downpour on the roof made communication difficult, yet we did managed to meet a great couple from Alsager in England. We all waited for the rain to stop, so we could walk the four hour track to the top of the mountain. An hour went by and the weather didn’t abate. This made the tracks difficult and dangerous, so we hired two very large, dodgy looking umbrellas and took the chairlift back down. That evening we discovered Dali’s vibrant night life, of quaint little bars, plastic chaired restaurants and street BBQ’s. We tried a new taste sensation each day, like fried beef with green chillies, BBQ beef with chilli, a Bai potato dish called grandmas potatoes, Tibetan momos, Tibetan special lamb, jiang shang bing, which is a kind of tangy pizza bread and many varying types of dumpling. We remained in taste bud heaven, hidden away from the evils of our multi-national fat dispensing, fast-food corporations. Not one in sight … yet! The next morning we decided to go for a rock climb. Unfortunately, our day out on the cliffs fell-foul of early rain. We spent the morning waiting at Café 88, a German bakery with really good products and an equally nice host. When the sun came out, we drove to the climb, despite the road looking pretty potholed, rutted and soggy. It didn’t take long for us to come across a bogged truck. We attempted to help and nearly suffered the same fate, yet our escape from calamity became short lived. Moments later we suffered a flat tyre. Mud covered our boots and pants, but we eventually got going. Once there, we carried our gear up the long, steep track to the cliff face and everybody appreciated our first magic view of Erhai Lake. We rock climbed for the rest of the day with my wife Katie scaling the face like a teenager, completing every climb. I, on the other hand, lugged a body the size of an elephant up that rock face, which ultimately caused my forearms to pump-up, harden and become useless. By mid-afternoon, my knuckles seemed to be dragging along the ground. Another hour and I may have turned back the evolutionary clock and made the stretched limbs a permanent arrangement. In the early evening, we bounced and jerked our way back to Sleepy Fish feeling tired, satisfied and excited at tomorrow’s offering of adventure. 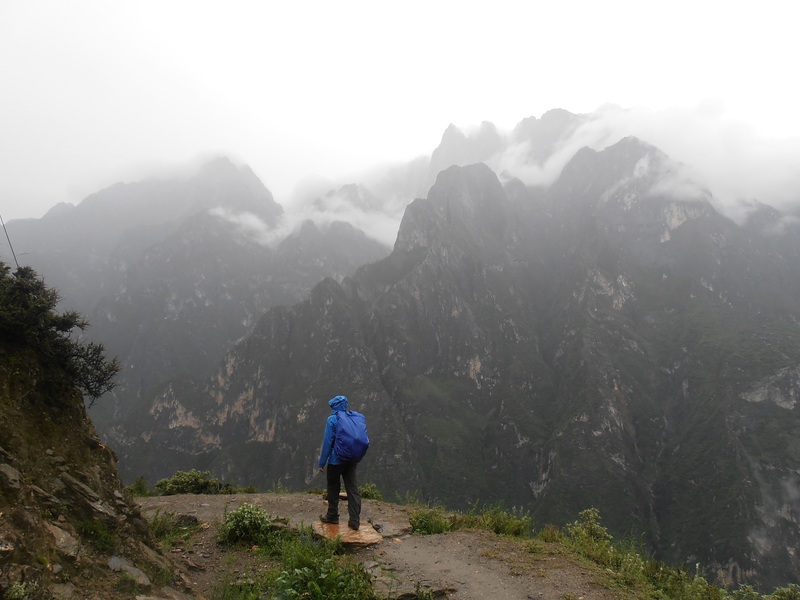 The mystery of famed ‘Tiger Leaping Gorge’ kept us awake talking and wondering most of the night. The following morning, after waiting at the wrong bus stop and almost getting on a vehicle going in a completely different direction, we finally caught what turned out to be ‘Oh-my-God-we’re-going-to-die’ Bus Lines, for our trip to the Gorge. Yet, even the six jarring hours of near accidents and bouncing from one pot hole to another, didn’t faze us or alter our high level of excitement. As we bumped along, we caught a glimpse of the highest peaks of the gorge just before our entry into Qiaotou; a pretty river town at the head of the canyon. Here we noticed that the women ‘seemed’ to do all of the work, while the men sat around smoking and gambling, and making sullen faces at the frazzled tourists, as they staggered white-faced from their buses. We asked for directions and felt a little suspicious, after receiving a multitude of differing opinions concerning our destination. We chose badly and headed out on the lower road, to start our trek. Fortunately, we only managed to walk six kilometres in the wrong direction, before eventually returning and beginning our trek, twelve kilometres later, at 5pm. After about half an hour on the track, we came onto the gorge proper and our mouths fell open in surprise. We found ourselves surrounded by an awesome kind of beauty; the hills around us grown to mountains of rock that pierced the clouds, rising majestically beyond in columns of jagged limestone teeth. 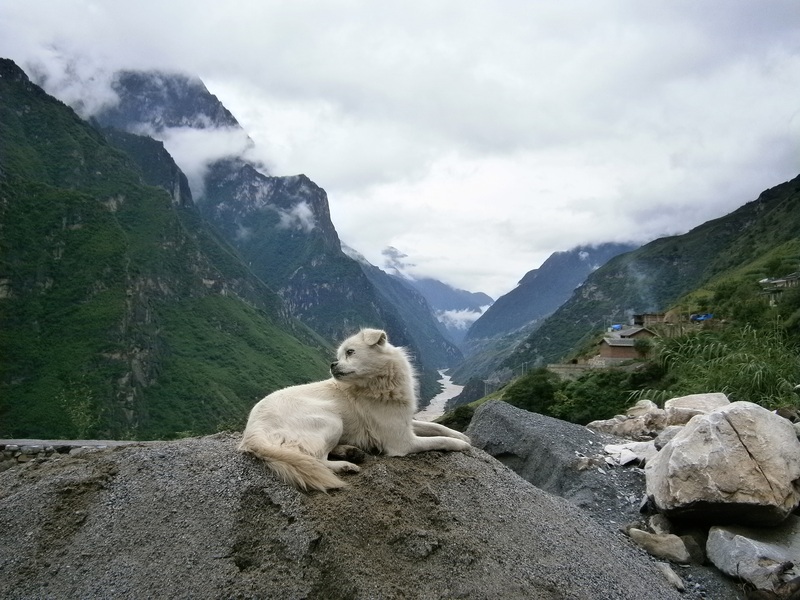 At a maximum depth of approximately 3,790 meters from river to mountain peak, Tiger Leaping Gorge is one of the deepest and most spectacular river canyons in the world. For around 15 kilometres, the Jinsha, or Golden Sands River; a primary tributary of the upper Yangtze River, passes between the 5,596 metre Jade Dragon Snow Mountain and the 5,396 metre Haba Snow Mountain, creating a series of spectacular rapids that rage chaotically under steep 2,000 metre cliffs. Legend says that in order to escape from a hunter, a tiger jumped across the river at its narrowest point, hence the great name. Yet, the poor creature needed a 25 metre miracle to get to the other side. That’s one amazing cat! 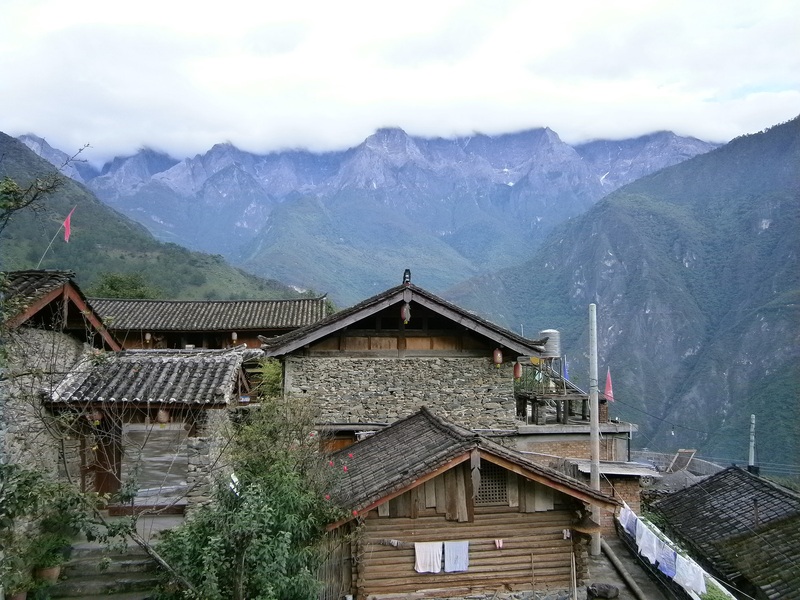 An hour further down the trail, we arrived at the Naxi (pronounced Nashi), family guest house. Later we found out that the inhabitants of the gorge are primarily the indigenous Naxi people, who live in a handful of small hamlets, where workable fertile land is available. Their primary subsistence comes from grain production and hikers, both foreign and Chinese. What a special place to stay. Apart from the stunning vistas and lovely earthy, authentic architecture, we received wonderful hospitality and delicious Naxi family food; fortifying us for the next day’s trekking. Nothing could be more special than sampling the Naxi family spirit, which we found to be akin to drinking petrol from a petri dish. The next day it began to rain steadily and the track became mud in the lower sections and slippery rock on the higher reaches. In some places, impromptu waterfalls cascaded and crashed over our very narrow pathways, which sometimes sloped towards vertical drops. This trek isn’t for the faint-hearted; anyone who suffers from vertigo, might well struggle on the narrow paths and the thousand metre drops. Astounding is the only way I could describe the hike so far. So much so that our camera fingers seemed to suffer from lactic acid, with the work-load they endured. We both felt it is worth coming all the way to South-Western China, just to experience this place. We met many interesting people as we tried to negotiate our way through the rain, none more wonderful than a lovely Chinese girl, who went by the name of Scarlet; chosen as her ‘English name’. At this point, the trek could not have been more perfect … until that is… we received a message through our Kindle that my beloved mother, had suffered heart failure and been taken to hospital. With no cell-phone or any other signal available in the gorge, we became desperate to get to a village. We soon discovered that none of the land-line telephones in the area worked either, due to the main line being down. That’s when Scarlet came to our rescue. She contacted her service provider and unlocked her phone from some kind of international block, so we could make the call. Fortunately, we were able to ascertain that my mother was in a stable condition and due to return home that afternoon. So … we continued our trek, walking with Scarlet until we descended to the banks of the churning river, near the end of the gorge. Here we decided to take some refreshment at one of the many appealing guesthouses along the waterfront and enjoy some more of the wonderful views; this time sheltered from the rain. At the table next to us, sat several tourists. When we asked them where they came from, they said Australia, but we wouldn’t know their tiny hamlet in the mountains of North-East Victoria. It turned out to be Mount Beauty, the town next to ours. Talk about a small world! The next morning, we hitched a ride back to Qiaotou, in time to hail a bus back to Dali. This time the journey took closer to seven hours, because of a local market that closed the road off to all traffic. With just about every kilometre travelled, our experience worsened until it became the bus ride from hell. Every time our non-air-conditioned bus stopped, most of the male occupants lit up a cigarette. I could hardly breathe. Apart from our bone shaking lack of suspension, we also witnessed the results of eight major accidents; one a fatality. Over time and in a confined space, the gobbing, wild bumping, suffocating smoke, flying rubbish and scenes of death, got to me and … I think I may have raved and yelled like a Banshee. Fortunately, a night of good company, a scrumptious Sichuan hot-pot and several medicinal gin and tonics, saved my sanity. Ken Grace is an Australian author. His debut novel Blood Prize was released in January 2014. Ken was born in regional NSW and grew up in the Murray River town of Howlong, where he completed his early schooling. He went to Albury High School, struggling through the curriculum. He loved to read, but he also suffered from aphasia, a learning disability. The teachers were not amused with his grammatically incorrect attempts at story telling. Ken also loved sport, particularly cricket and Australian Rules football. Ken’s love of a good story may have originated from Harry Osborne, his beloved late Grandfather, who could exaggerate an uneventful walk beside the river into ‘The Old Man and the Sea’. Ken had several long-term jobs, before deciding that he wanted to write his first novel, and subsequently become a full time author. Ken and his wife, Katie moved from Queensland where they had been living to rural Victoria (a ‘Tree Change’). Here he began writing his first novel. 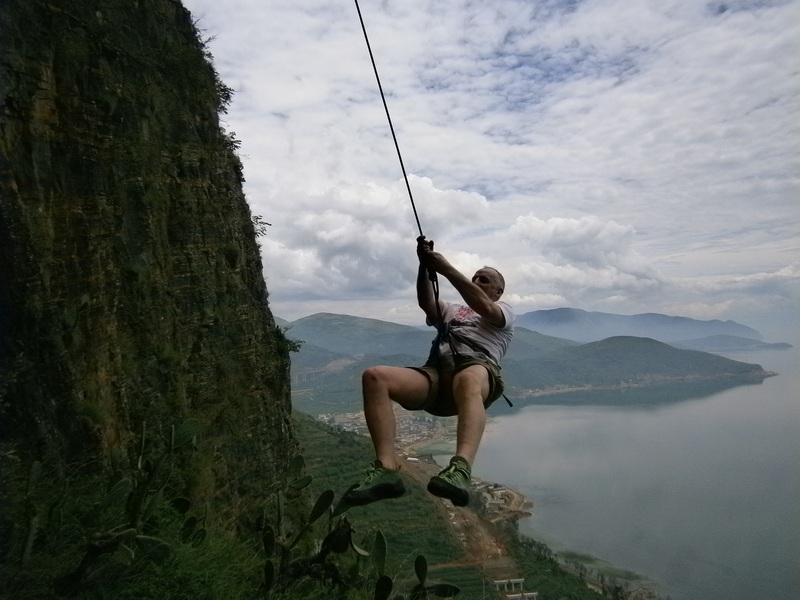 Ken has a passion for travel and trekking and fits these activities in between writing his next novels. 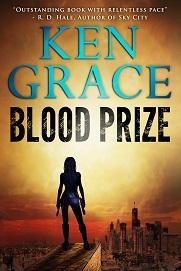 Ken’s debut novel Blood Prize is currently at the promotional price of just 99c (rrp $5.99). Grab a copy today!